Individuals or groups, examination time around 15 minutes. The TIC test may be conducted using traditional paper version or online. 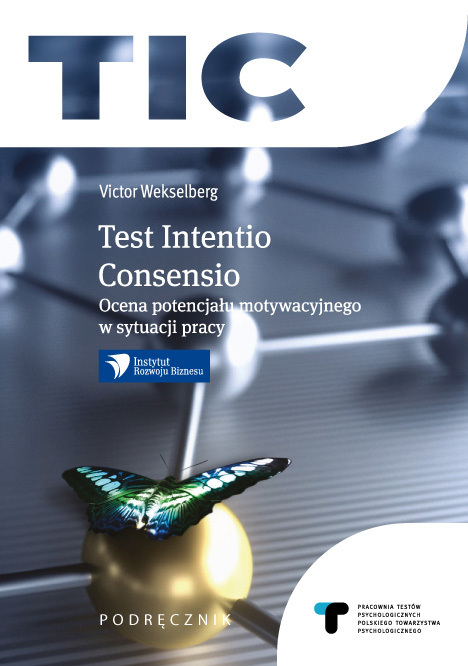 Description: The Intentio Consentio Test measures two global personality features: readiness to make an effort, here defined as Intentio, and readiness to co-operate, defined as Consensio. TIC is a questionnaire containing 64 items which have the form of assertions. The assertions deal with various aspects of the image of work and respondents' work performance. The respondent estimates, using a 7 degrees scale, the extent to which s/he agrees with each assertion. The items are divided between two main scales (Intentio and Consensio), each containing three sub-scales which deal with the ideal image (Visions), the real image (Models) and the performance programs (Programs). The scales, sub-scales and detailed scales results give the information about readiness to make an effort and to co-operate, whereas the divergence indices between visions and models substantiate the assessment of motivational potential. The TIC test may be conducted using traditional, paper version or online. For the purposes of this instrument a dedicated test platform was designed and made available. It allows to conduct the test online, calculates the results and generate reports. Validity: The results of factor analysis confirmed the presumed structure of the test. The validity is also supported by the connections of the Intentio and Consensio features with constructs which are analogous at the level of theory as well as with academic and professional success. Reliability: Internal compatibility of the main scales and the sub-scales was assessed using the Cronbach alpha coefficient. For the main scales the coefficients were high enough to assess their reliability as satisfactory, whereas for the sub-scales they were low. Norms: The sten norms, for persons aged 18-65, are based on results of the research including a total of 2546 respondents. Application: The TIC test explores the features of personality structures connected with work and decisive of readiness to make an effort and to co-operate. The TIC test may be used for the purposes of everyday counselling in organization psychology. The tool will also be useful in assessing employees' motivation and committment, improving selection methods for various work positions, and the research of human capital development. The TIC test will provide knowledge enriching the assessment of particular competences in Assessement Centers and Development Centers. The TIC test was designed by the Institute of Business Development and released by the Psychological Test Laboratory.